I’m feeling wistful for Italy. Exactly one year ago, I was starting an eight week sabbatical, journeying to Italy to drink in the cuisine…and the wine. It was harvest season in Tuscany, after all. I consumed a lot of wine. One wisecracking travel agent described it as, “Italy on three bottles a day.” I did managed to learn a thing or two about the food, in spite of myself. Things are different this year. At the moment, my most exotic destination is my kitchen on Long Island. Surprisingly, Long Island is becoming a bit of a food destination in its own right. When two dear friends, whom I’ll call “Valentine” and “Proteus” decide to accept an eight-month-old dinner invitation on the spur of the moment (Our friendship is deeply rooted in spontaneity. It keeps things fresh! ), I am faced with the drama of organizing a respectable dinner with far less than my normal prep time. I can do this. I’ve trained for these kinds of moments. It’s what developing a culinary sensibility is about. As soon as I hang up the phone, I spring into action. I consult the Silver Spoon cookbook – The Bible of Italian Cuisine. I pull together the essentials for a late summer feast, inspired by the ingredients and culinary heritage of Italy. Here’s an opportunity to taste the flavors of Emilia Romagna, Tuscany and Florence again without even leaving my kitchen. I strategize over bruschetta, salad, pasta with rosemary and roast pork. What I loved most about Italy was the simplicity of the cuisine. No need for a cast of thousands, just a few outstanding ingredients. The dessert will be particularly important for these guests, as they are passionate about their sweets. What shall it be? Frosted layer cake? Homemade ice cream? Biscotti? Cannoli? I am flummoxed by the choices. 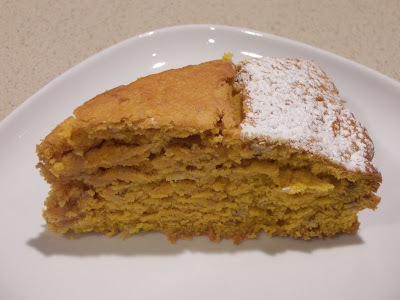 Torta di Zucca, or Pumpkin Cake jumps off the page. Simplicity at its finest. I recall the cakes we ate in Italy. Folded together in minutes, the batters consisted of a little flour, eggs, some sugar, a distinctive flavor, and perhaps an unexpected ingredient baked in a single layer to conclude a meal with understated elegance. Torta di Zucca offers that kind of denouement. One half-cup of sweet butter is creamed with 1 cup of superfine sugar and two eggs until light and fluffy. 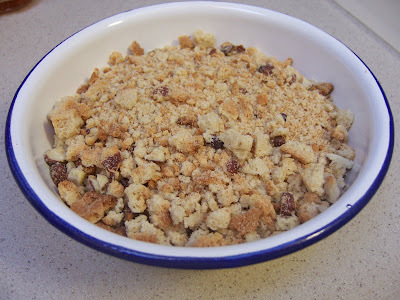 Next add one cup of can pumpkin puree, two cups of self-rising flour, the grated zest of one lemon, 5 tablespoons of milk and the magic ingredient – eight crushed almond biscotti. The cookie crumbs give the soft ginger-colored batter dimension, crunch and the sweet aroma of almonds. Bake for 45 minutes in a single layer. 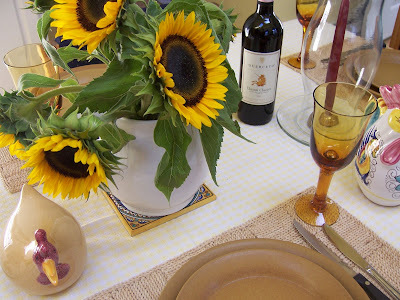 A few sunflowers, some Italian ceramics and the stage is set for dinner in Tuscany – a perfect afternoon of food and wine for a couple of gentlemen from Verona. 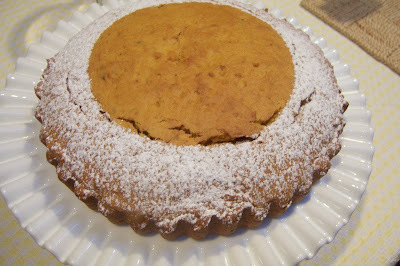 And, the Torta di Zucca? No theatrics – just a rich, nuanced, memorable performance. okay, T.W. 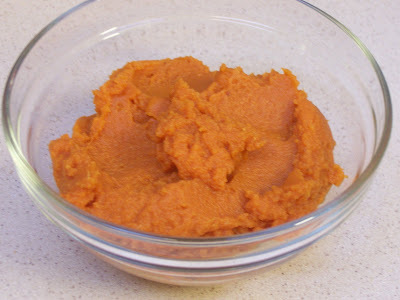 , it looks like you are ready for the fall.I just love pumpkin anything! I was thinking the same thing...pumpkin...Fall. Of course there are pumpkins at our local farm stands now, so I guess it really is time for wonderful recipes like this. T.W., I have never seen this kind of pumpkin cake, it looks wonderful! That table is so beautifully set, what a privilege to be a part of that meal! hmm tasty! I love pretty much anything pumpkin. It is one of the best parts of fall in my opinion. 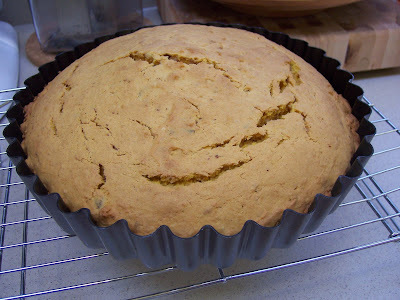 Since I can't make it to Italy any time, I'll have to try your torta di zucca. Anything with pumpkin gets my vote; I just love it. I work to travel... next year it's Tuscany. I'll think of you as I enjoy my torta di zucca and espresso.